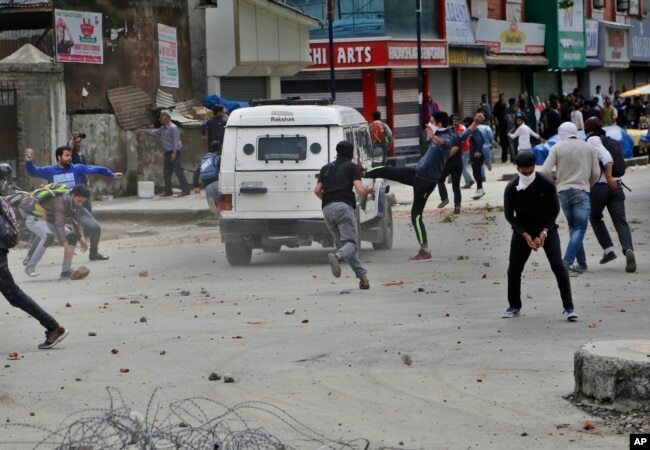 NEW DELHI, April 27, 2017: Indian authorities hope sweeping restrictions placed on social media in Indian Kashmir will help control widening street protests and growing violence in the region. But observers say the latest order will do little to stem growing alienation in the restive Himalayan region. Authorities have shut down 22 social media sites such as Facebook, WhatsApp and Twitter for a month. The official order asking internet service providers to block the sites said they are being used by “anti-national and subversive elements” for “vitiating peace and tranquility” in the state. Kashmir has often faced restrictions on the internet, and even mobile phone services have been shut at times. But the latest clampdown is much wider in its scope and comes as social media begins to play a larger role in an increasingly volatile situation in India’s only Muslim-majority region. In the past three weeks, graphic videos claiming to show abuses by security forces have gone viral. The one getting the most attention shows a young man strapped to the front of an army jeep and paraded around villages in the region. School and college students have emerged on the streets for the first time to join mobs throwing stones at security forces, and earlier this month, eight people were killed in a violence-marred parliamentary election. Officials say social media is not just being used to spread images, but also to rally crowds that attack security forces. A police officer in Kashmir, who did not want to be quoted, said the order will help check the spread of rumors. However banning social media will do little to address the rising tide of anti-India sentiment, said Shujaat Bukhari, editor of the Rising Kashmir newspaper in Srinagar. “If there is so much of anger, it actually adds to that anger, it does not help to recede (quell) that anger,” he said. More than a decade of relative peace began deteriorating last summer in Kashmir after security forces killed local militant leader Burhan Wani. Analysts say this summer promises to be no different. Colleges and schools in Kashmir have been shut for more than a week as India tries to quell the near daily protests. On Thursday, three Indian soldiers died and five others were injured in a pre-dawn attack on an army camp by militants in Kashmir’s Kupwara district. Two militants were also killed. Earlier this week, Chief Minister of Jammu and Kashmir, Mehbooba Mufti, visited New Delhi and urged Prime Minister Narendra Modi to open dialogue to contain the deteriorating situation in the state. She told reporters he wanted to hold talks after the situation normalizes. Analysts say the Hindu nationalist federal government appears to be taking a hard line against the protesters. Bukhari said the problem in Kashmir is larger than a social media problem.